John Byne is a Consultant specialising in both residential and commercial conveyancing, and has previously dealt with other areas of law including matrimonial and probate, wills, crime and general litigation. 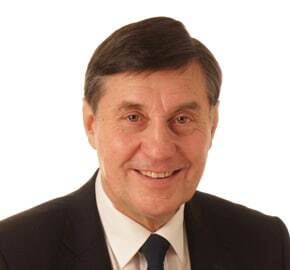 John was educated at Dauntsey’s School in Wiltshire and has worked in the legal profession since 1968. He took his articles in Torquay and, upon completion of the Law Society exams at the Guildford College of Law, qualified as a solicitor in 1974. He then went on to work at firms in Totnes and Barnstaple, before setting up his own practice in Torquay in 1977. He was a founder member of the Torbay Duty Solicitors scheme, which was set up in 1987. Johns interests include running, sailing, rugby, walking and enjoys Opera music.